Desire Lines - Amsterdam — Copenhagenize Design Co.
Copenhagenize Design Company took its Desire Lines Analysis Tool to Amsterdam. 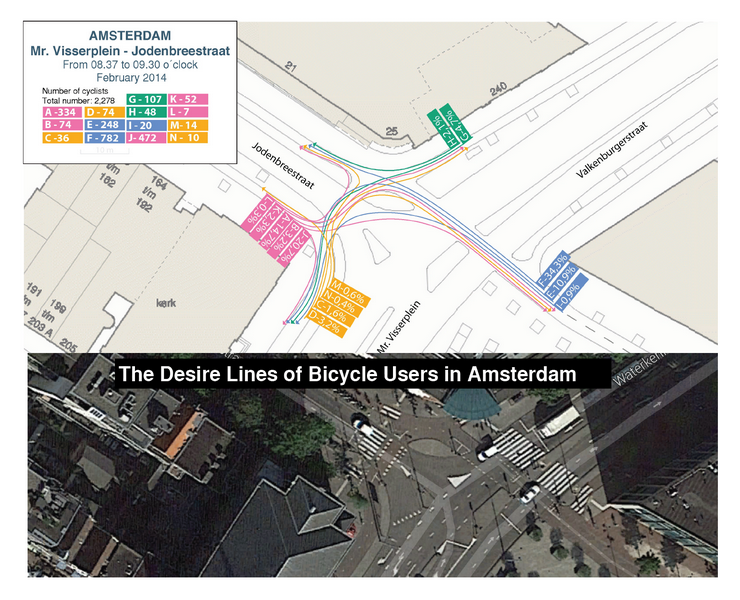 In close collaboration with the University of Amsterdam, we analysed the Desire Lines and behaviour of bicycle users at nine intersections in the city. Building upon our documentation of Desire Lines in Copenhagen, we mapped the trajectories of bicyclists across each intersection and gathered valuable data about user behaviour. Our Desire Lines Analysis illustrates how bicycle users react to the design of existing infrastructure and whether or not improvements can be made. These data can then be compared with our observations of bicycle users in Copenhagen to understand how reactions to infrastructure may differ.